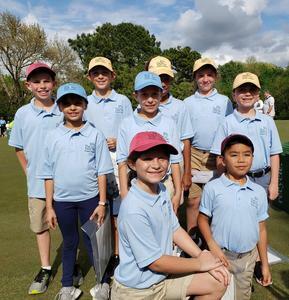 TOMBALL - Tomball ISD students from Creekview Elementary, Decker Prairie Elementary, Timber Creek Elementary, Tomball Elementary and Willow Creek Elementary recently participated in the First Tee Golf program. The First Tee is a youth development organization introducing the game of golf and its inherent values to kids and teens. Through after-school and in-school programs, they help shape the lives of young people from all walks of life by reinforcing values like integrity, respect, and perseverance through the game of golf. One fourth grade boy and girl were chosen from each campus to participate in the First Tee Champions Challenge because of their golf skills and most importantly because of their outstanding character through their leadership, kindness, hard work, dedication, and perseverance. Creekview Elementary, Timber Creek Elementary and Willow Creek Elementary students were on teams that placed first in their group. Grant Kilgore and Ben Haywood received second place overall and Ella Taylor received third place overall in their respective groups.